RickJ's Handicapping Picks is on pace for the 3rd 13+ unit month in a row!!! Take a look at the 3 day free trial!!! 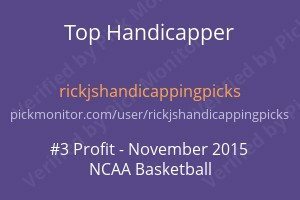 RickJ’s Handicapping Picks is on pace for the 3rd 13+ unit month in a row!!! Take a look at the 3 day free trial!!! On Friday we had a busy day with 6 plays going 4-2 for +2.21 Units. In college hoops, we won with TCU +7 80-86 and Oregon St +21 63-76. We lost with Oklahoma +6 50-73. In the NHL we went 2-0 winning with Nashville +141 4-0 and Carolina -111 3-2. Finally, in the NBA we lost with Denver Under 212 124-122. We got off to a slow start this month but with one day left in December, we are +13.15 Units. If this holds up today we will have our 3rd +13 unit or more month in a row. That is 40 units in 3 months. 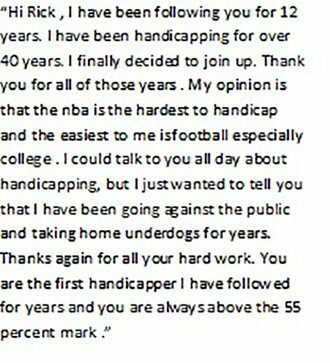 As I have said many a professional handicapper would be thrilled to be able to produce 30 to 40 units a year. Most cannot show a profit. Today is going to be a very busy day with a full slate of games in every sport. Betting is 50/50 with the line moving from -3-112 to -3. Models are neutral, Variables are neutral and public betting is neutral. So, what is one to do when everything you look at is neutral? A Pass of course and that is what I am going to do. Betting is 55% on the dog (sound familiar?) with the line moving from -4-101 to -3.5-101. So we have the line moving with the action. Models are split on the game with an ever so slight bias to Georgia Tech. And I mean slight! Variables are neutral and public betting favors Georgia Tech. Nothing really to go on here as any one of the things I consider is not enough to show a profit at the end of the year. it’s only when everything lines up or all but one with the one being neutral can you show a profit. So my handicapping compels me to pass on the game. So my rule for as long as I can remember is ” I do not have to have an edge to wager, but, I do need to think I have an edge”! Otherwise, what is the point? The books have done nothing to deserve getting your hard earned money. And I say that with many a good friend being very large books. Look for plays shortly before game times. None have been sent out yet today.